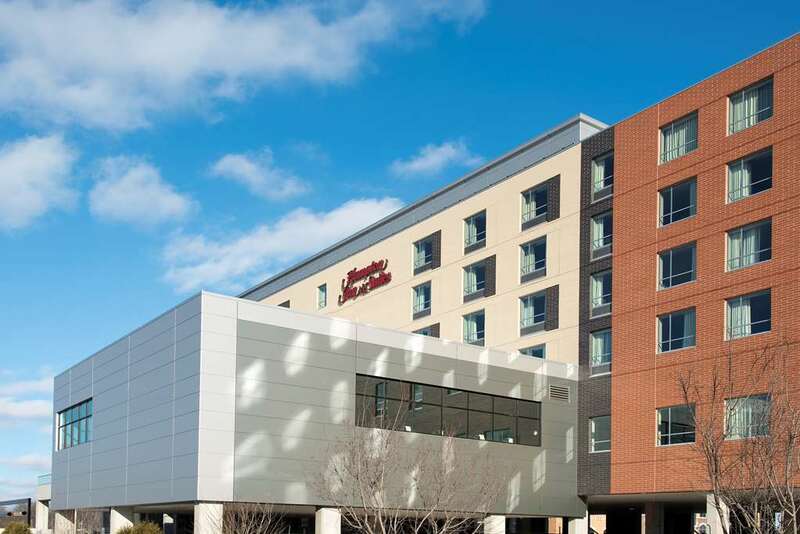 The stylish Hampton Inn - Suites Grand Rapids Downtown hotel is set along the Medical Mile and conveniently located just off of I-196 less than one mile from the city center. Expanding medical programs for Michigan State University and Grand Valley State University are shaping the future for the growth of the Medical Mile. The hotel is in close proximity to Helen DeVos Children*s Hospital Spectrum Health Mercy Health and other local hospitals. Fill your schedule in Grand Rapids with area attractions including Frederik Meijer Gardens - Sculpture Park Gerald R. Ford Museum and John Ball Zoo. Whether you*re attending a convention at DeVos Place or experiencing Beer City USA*s multitude of breweries we have the perfect room for you. After a busy day unwind in a spacious room or suite with free WiFi and a 42-inch HDTV. Relax in our heated indoor pool and hot tub or lounge on our seasonal outdoor terrace for some fresh air. Stop by our 24-hour Treat Shop in the lobby for a midnight snack. Wake up to a free hot breakfast buffet served daily or if you*re short on time grab a Hampton*s On the Run Breakfast Bag for a healthy meal on the go. Leo*s Restaurant: Exquisite seafood and classic cuisine in an elegant yet casual atmosphere. The Omelette Shoppe: famous omelettes and baked goods using only the freshest ingredients available. Everyday our bakers prepare fresh baked gourmet breads and rolls including our famous homemade pecan rolls and cinnamon rolls. Grand Rapids Brewing Co.: Organic ales - a menu of locally sourced pub grub served in a rustic setting with reclaimed wood. HopCat: Woodwork-filled brew pub with a massive beer list offers creative pub fare - brunch items. 7 Monks Taproom: Cozy woodsy tavern with refined American pub grub 46 beers on tap - kegs of wine. Grove: Premium restaurant serves an ever-evolving menu of farm-to-table fare - sources sustainable wines.